Wing Commander creator's game has made its Kickstarter goal with weeks to spare. Just a few days ago Cloud Imperium Games Corporation took its space sim Star Citizen to Kickstarter, after already raising a little more than $1 million. Earlier today Star Citizen made its Kickstarter goal of $500,000. Cloud Imperium Games' personal crowd funding system continues on, meanwhile, raising more than $1.3 million of their $2 million goal at press time. As the days count down to the finale of both efforts, it seems more and more likely that Chris Roberts' "AAA Space Sim" will see completion and publishing. 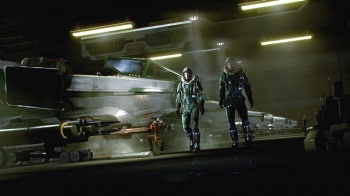 Billed as a spiritual successor to Roberts' previous games, such as Wing Commander, Star Citizen intends to be a fully realized galaxy in which players can wage war, trade, and explore. Additionally, Cloud Imperium Games intends to provide weekly or bi-weekly updates to the game. The continued development of the game will not be supported by a subscription, but instead by an in-game purchase model. The Cloud Imperium Games Corporation internal fundraiser will wrap up November 9th, and the Kickstarter will close November 19th.